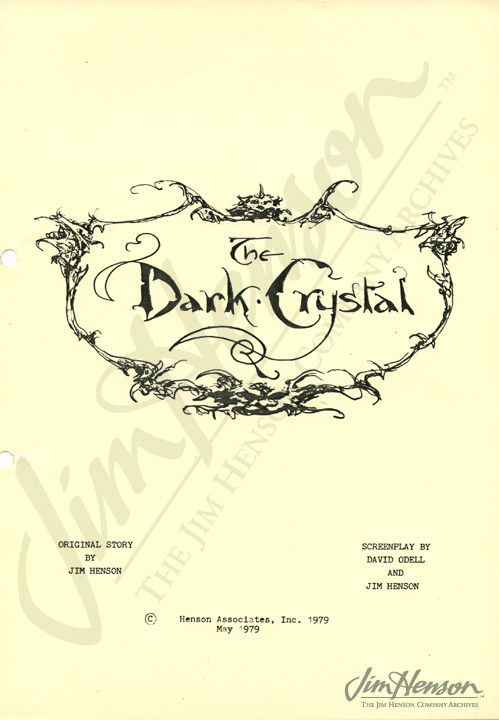 Months before Jim asked writer David Odell to think about The Dark Crystal, Jim began the writing process in an airport hotel, jotting down his ideas for the world of Gelflings, Skeksis, Mystics and Pod people. The creatures and settings for the film came easily to Jim, but crafting a rich and compelling story that would really bring these characters to life was a challenge. During The Muppet Movie shoot the summer before, Jim had met David Odell and asked him to join The Muppet Show writing team. He had great success there, sharing an Emmy award for writing on the Carol Burnett episode. So when it came time to start setting down the script for The Dark Crystal, Jim asked Odell to collaborate. 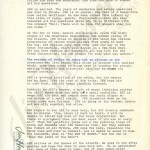 Odell had been writing screenplays for almost a decade at that point and brought his considerable experience to the project. 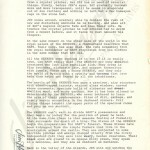 He had Jim’s original outlines, titled Mithra and The Crystal, to work from along with notes from Brian Froud and Frank Oz about characters, situations, and the structure of the story. 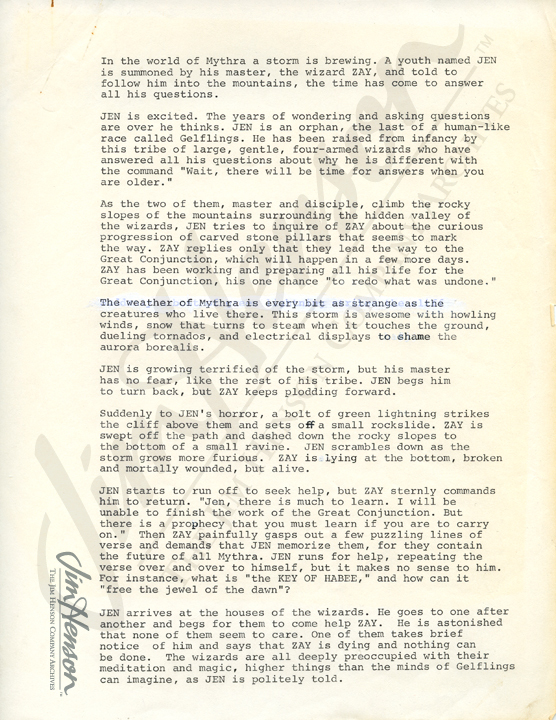 Along with his Muppet Show duties, Odell spent a great deal of time with Jim writing treatments and scenes, eventually producing a first draft treatment at the end of 1978 and then a full screenplay by the following May. Odell continues to be involved with the characters from The Dark Crystal, working with the Henson Company on a script for a possible film sequel. 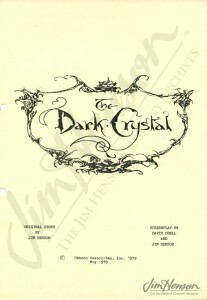 David Odell’s first treatment for The Dark Crystal, 1978. 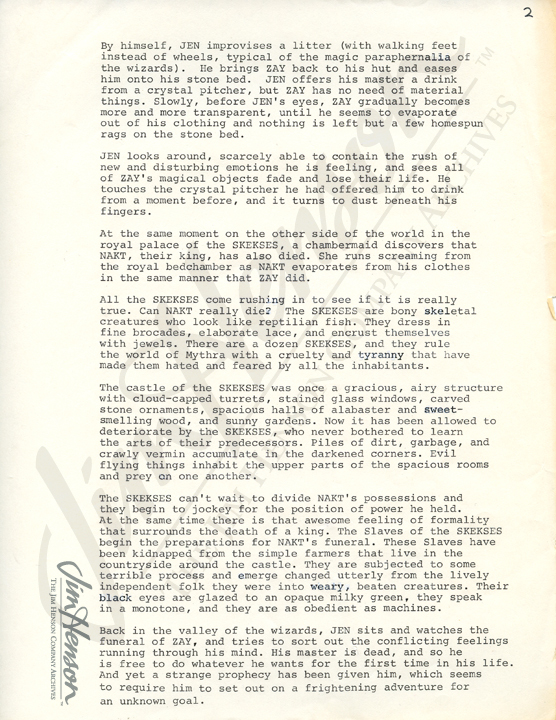 Cover page from the first draft screenplay for The Dark Crystal, 1979. This entry was posted in 01-January '79, 1979, Dark Crystal and tagged Brian Froud, David Odell, Frank Oz, Gelflings, Mystics, Pod people, Skeksis, The Muppet Movie, The Muppet Show. Bookmark the permalink.